Today we are talking all about my Mood Board, why you should have one, and how you can make one yourself! I have been using mood boards since I was a senior in high school interning at a local magazine company. They are such a great way to plan ahead, establish an esthetic, remind you of your goals, and provide you with TONS of inspiration! 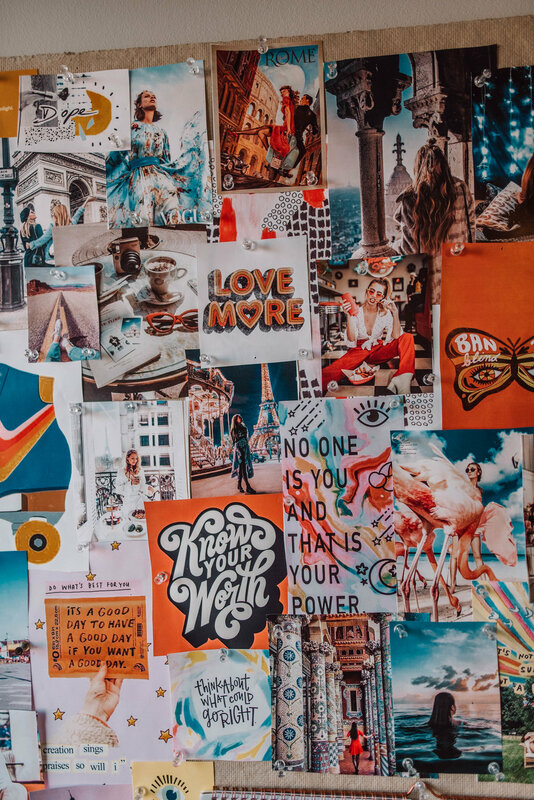 Some people prefer to call them vision boards, but no matter what you like to call them, they get the job done! 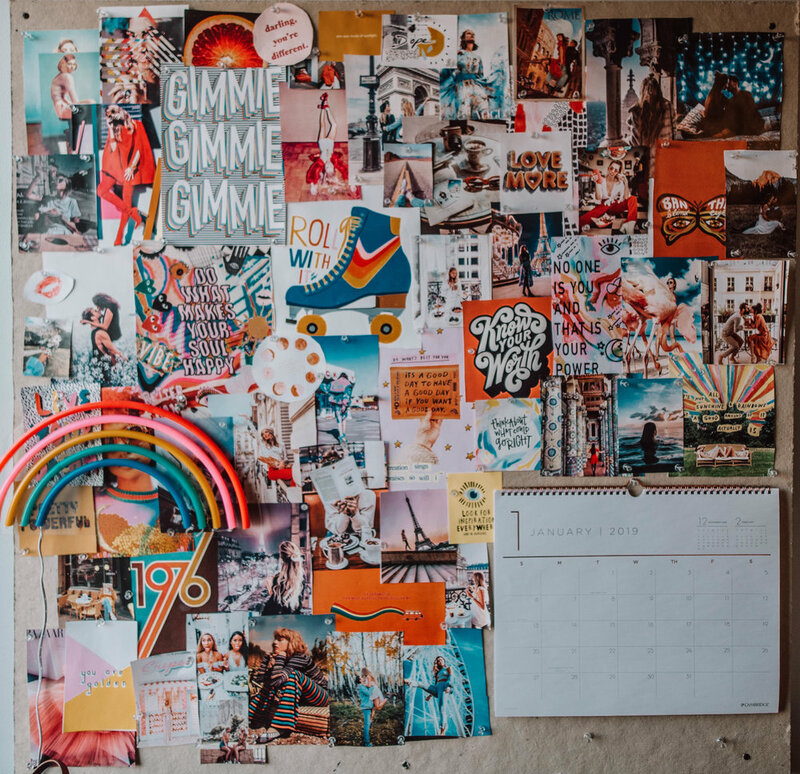 AND depending on what type of mood board you create, it can also can serve as a cute decor piece in your workspace or room! Now back tracking to my high school days, I came up with the idea to start implementing mood boards in the office to help us plan and brainstorm ideas for upcoming issues! We had a total of 3 mood boards that we would put together for different issues at a time! When the issue came out we would save all the images we compiled and save them in a file so we could look back in years to come at our inspiration at the time! Below I will include some photos of the boards I put together for them! I love the whole mood board idea that I decided to start my own at home. When I went off to college but was simultaneously trying to establish my instagram at the same time, mood boards helped me find clarity. I started making them with photos from Pinterest that inspired me or fit into a certain aesthetic that I was trying to create. Below I will include a few that I created during that time! I loved to make them seasonally. Now that content creation is my full time job I really love utilizing mood boards for inspiration and even fun caption ideas for my photos! Mood boards don’t have to be visually appealing either if that is not your thing! Sometimes mood boards are great for just pinning up any idea you have possible whether it be images, sticky notes, articles, you name it! On my mood board currently I have colorful images that inspire me and match my aesthetic! I also like to include a calendar to plan and sometimes will pin up a sheet of paper where I write ideas down or I make a checklist of content I need to shoot! Here is what mine looks like in my workspace at my apartment! Mood boards are really simple to make! First you’ll need a space to pin up your inspo. Some people use walls for this, so if you don’t mind putting tacks in your wall this is an option or you can always use tape! Personally, I like a physical board to Pin stuff up on. Some people will use cork bulletin boards from places like target, Walmart, or amazon. My only complaint with this method is the size for the price. If you want something super massive you may want to consider a different option! But if you like this idea and the simplicity of it, you can click HERE to find a great one online. If you are wondering what I use, I actually bought a massive sound proof board from a local home improvement/hardware store! the material itself is actually called Homasote. I was able to get a 4 ft x 8ft board for only $24! I cut mine in half to be 4x4! It is a much cheaper price compared to the $50-$100 options you can find online for the cork boards! Next, all you need are some tacks and a little inspo! Like I mentioned earlier, you can use anything from magazines, articles, sticky notes, and other materials to put together your board! I personally always turn to Pinterest for my inspiration! Below I have linked my Pinterest board that I dedicate to my mood boards! On it you will find all the images on my current board + more! Hopefully you guys found today helpful! If you end up creating a mood board I would love to see how yours turned out! Tag me in your photos or on stories and use the hashtag #JosieMoodBoards so I can see your creations!